In 1991, the area immediately to the west of the underground Sedgewick Undergraduate Library was confirmed as the site for Walter C. Koerner Library. Construction began in January 1995. Sedgewick/Koerner continued to operate, maintaining most library services. The two underground floors of Sedgewick were renovated and upgraded to current library and safety standards. These two levels were extended on the west to become the base of the new construction between Old Administration, Mathematics, and the Math Annex. 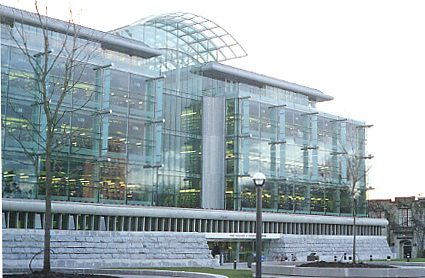 The Walter C. Koerner Library opened officially on March 10, 1997. The new construction extends five stories above the level of the mall. The new design, while classical in order and structure, is modern in material and technology, with a central entry on axis with the Main Library and a tripartite vertical organization into base, body, and attic. The base is composed of a battered granite wall, complementing the materials of the Main Library. The granite is from the same quarry as the granite used on the Main Library. There is a course of clerestory windows and a continuous planter above. On the front façade, the three mid levels are sheathed in a flush plane of glass shielded by a system of external glass screens. The transparency of these levels allows the building to 'read' as a library and permits the maximum amount of appropriately screened daylight into the building. Level seven, the classical attic, is set back from the levels below. This level is finished in a sloping natural zinc roof. Zinc is a soft grey material that weathers and ages well. This is also the major material of the side elevations. The back facade is clad in stucco with a grid of diamond-shaped windows. The central nave is top-lit by a shallow vault of translucent glass. Walter C. Koerner Library's area totals 17,200 square metres: 7,000 square metres of new construction and 10,200 square metres of renovated space from Sedgewick Library. Functions within the building are composed of 54% for collections (6,420 shelving units for an approximate total of 800,000 volumes), 25% for service and offices, and 21% for 920 study spaces. Funding was through donations to UBC's World of Opportunity Campaign, with matching funds from the provincial government and the President's discretionary funds. It is named in honour of Walter C. Koerner, recognizing his lifetime commitment to and support of the University and the Library and his substantial gift toward the construction of Koerner Library.